Directions (1 – 5): In each of these questions, two equations numbered I and II with variables x and y are given. You have to solve both the equations to find the relation between x and y. If x = y or relationship between x and y cannot be determined. Hence, relationship between x and y cannot be determined. Direction (6 - 10): Study the following graph carefully and answer the questions below it. Number of students (Males & Females) passed out from various Colleges in a year. 6. What is the average number of students (Male and Female) passed out from all the colleges together? Average number of students (males and females) passed out from all the colleges together. 7. The number of Females passed out from college C is approximately what percent the total number of Females passed out from all the colleges together? 8. What is the difference between the total number of students passing out from college A and the total number of students passing out from college E? 9. What is the respective ratio of the total number of Males to the total number of Females passed out from all the colleges together? 10. 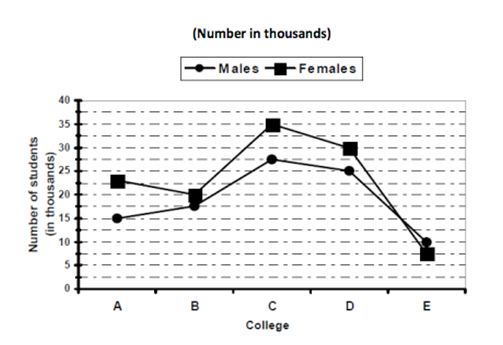 The number of Males passing out from colleges A and B together is what percent of the number of females passing out from colleges C and D together? e) If x = y or relationship between x and y cannot be determined. Direction (6 – 10): Study the following graph carefully and answer the questions below it. Number of students (Males & Females) passed out from various Colleges in a year. 6) What is the average number of students (Male and Female) passed out from all the colleges together? 7) The number of Females passed out from college C is approximately what percent the total number of Females passed out from all the colleges together? 8) What is the difference between the total number of students passing out from college A and the total number of students passing out from college E? 9) What is the respective ratio of the total number of Males to the total number of Females passed out from all the colleges together? 10) The number of Males passing out from colleges A and B together is what percent of the number of females passing out from colleges C and D together?